Snow White and the Seven Dwarfs (1937) is the first full-length animated feature (83 minutes in length) in color and with sound, one of Disney's greatest films, and a pioneering classic tale in film history. It was financed due in part to the success of Disney's earlier animated short, The Three Little Pigs (1933). Although dubbed "Disney's Folly" during the three-four year production of the musical animation, Disney realized that he had to expand and alter the format of cartoons. It was the first commercially successful film of its kind and a technically brilliant, innovative example of Disney animation. It was the first film with an official soundtrack and the first film to release a motion picture soundtrack album. The story was adapted from the original Brothers Grimms' Fairy Tales, but in a bowdlerized or sanitized version, without overt sexual references or violent content. 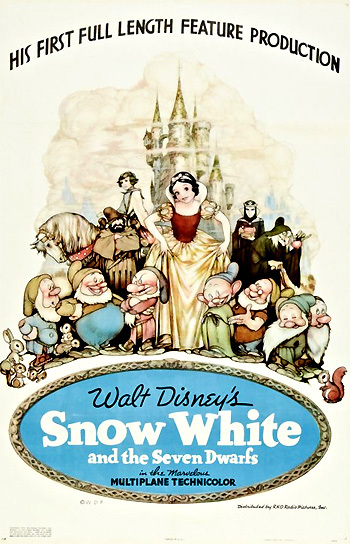 Disney's version of the Grimm Brothers' fairy tale was the second of its kind - the first was a five-minute Snow White (1933) starring Betty Boop (with an appearance by Cab Calloway). The story is a familiar one: raised by a wicked and vain Queen (voice of Lucille La Verne), beautiful Snow White (voice of nineteen year-old Adriana Caselotti) is taken into the forest to be murdered. However, the Huntsman (voice of Stuart Buchanan) cannot commit the horrible deed, so she flees and finds refuge in the home of seven diamond-mine workers/dwarfs. When the Queen discovers that Snow White is still alive, she transforms herself into an old hag and brings a poisonous apple to the young girl. A kiss from Prince Charming (voice of Harry Stockwell) rouses Snow White from her deep slumber. The film is sprinkled with wonderful, sing-along songs including "Heigh Ho," "Whistle While You Work," and "Someday My Prince Will Come" - none of them were considered in the Best Song nominating category. The risk-taking film made use of the multi-plane camera (first used in Disney's own animated, Oscar-winning Silly Symphonies short, The Old Mill (1937)) to create an illusion of depth. It introduced human characters (the jealous Queen, the Huntsman, the Prince, and Snow White herself) modeled on live actors, and used larger painted cels and drawing boards. It took almost four years and an astronomical (at the time) $1.7 million to create, and was released for its premiere during the Christmas season of 1937. Its single nomination was for Best Score. For the film's remarkable achievement, Walt Disney was awarded with an Honorary Oscar - the film was "recognized as a significant screen innovation which has charmed millions and pioneered a great new entertainment field for the motion picture cartoon." My sincere appreciation to the members of my staff whose loyalty and creative endeavor made possible this production. (The First Page:) Once upon a time there lived a lovely little Princess named Snow White. Her vain and wicked Stepmother the Queen feared that some day, Snow White's beauty would surpass her own. So she dressed the little Princess in rags and forced her to work as a Scullery Maid. Each day the vain Queen consulted her Magic Mirror, 'Magic Mirror on the Wall, Who is the fairest one of all? '...and as long as the Mirror answered, 'You are the fairest one of all,' Snow White was safe from the Queen's cruel jealousy. Slave in the Magic Mirror, Come from the farthest space, Through wind and darkness, I summon thee. Speak. Let me see thy face! Mirror: Famed is thy beauty, majesty. Behold, a lovely maid I see. Rags cannot hide her gentle grace. Alas, she is more fair than thee. Queen: Alas for her, reveal her name. Mirror: Lips red as the rose. Hair black as ebony. Skin white as snow. To the Wicked Queen's horror, her worst fear is confirmed. She realizes the mirror has described her scullery maid, Snow White. Make a wish into the well. And if you hear it echoing. Your wish will soon come true. Now that I've found you, hear what I have to say. One song, only for you. Ever entreating, constant and true. One love, that has possessed me. One love, really for you. One song, my heart keeps singing. Of one love, only for you. The jealous Queen is angered by the mirror's revelation and jealous of the attention paid to Snow White by the Prince. Seated on a peacock throne, signaling her extreme vanity, she orders an evil plan to be executed by her huntsman: "Take her far into the forest. Find some secluded glade where she can pick wild flowers...And there, my faithful huntsman, you will kill her!" Her eyes expand glaringly when she issues the vicious command. The huntsman objects: "But your majesty, it is a princess!" The Queen will not allow any argument: "Silence! You know the penalty if you fail...But to make doubly sure you do not fail, bring back her heart in this." She presents him with a red box, adorned with a heart-shaped latch. He must return with the dead girl's heart in it, as proof that he has carried out the task. The next day, Snow White has exchanged her rags for a pale yellow dress, a dark red-lined cape over a navy blue vest with blue and red sleeves and a high white collar. She is taken to a beautiful, sunny forested area to pick flowers. She befriends a little lost bluebird: "Come on, perk up. Won't you smile for me? Ha, ha, ha. That's better. Your mom and papa can't be far. There they are. Can you fly? Goodbye. Goodbye." The huntsman approaches from behind to stab her - his shadow overtakes her. His angry green eyes flare as he raises the knife in his hand and is poised to strike. Snow White turns and screams when she sees what he plans to do. But he hasn't the heart to carry out the deed - to murder an innocent girl. He drops to his knees and begs her to forgive him: "I can't. I can't do it. Forgive me. I beg you your highness." Snow White doesn't understand. He explains the Queen's evil plan, and then bids her to run away deeper and deeper into the woods to escape her stepmother's murderous intentions. He abandons her, crying: "Run! Run away! Hide! In the woods. Anywhere. Never come back. Now go! Go! Go!" She flees into the surrealistic depths of the dark night of the forest, where her fear-filled imagination turns everything into nightmarish id-like monsters ready to devour her. An owl's huge eyes frighten her. Flying bats scare her. Craggy trees seem to reach out and pull at her, snagging her clothes. She falls into a dark pit and a dark body of water, where the shapes of fallen logs change into alligators. Grasping claws of another tree threaten her. Leaves blown in a whirlwind follow her as she runs for her life. The song has cheered her spirits: "I really feel quite happy now. I'm sure I'll get along somehow. Everything's going to be all right. But I do need a place to sleep at night. I can't sleep in the ground like you. Or in a tree the way you do. And I'm sure no nest could possibly be big enough for me. Maybe you know where I can stay. In the woods somewhere...You do? Will you take me there?" They lead her to a quaint little cottage, to which she exclaims: "Oh, it's adorable, just like a doll's house. I like it here." To see through the front window of the thatch-roofed Tudor cottage, she must wipe the dust away. "Oh, it's dark inside." After knocking, it appears no one is home. They enter the tiny front door - everything inside is smaller than normal and messy, so she assumes it is the home of children: "Why there's seven little chairs, there must be seven little children. And from the look of this table, seven untidy little children." She observes the messy dining table, a pick axe stuck in the table, the dusty fireplace, cobwebs everywhere, a pile of dirty dishes, and an unused broom. [The carved wooden adornments of the interior of the cottage reflect the skilled craftsmanship of its occupants.] She wonders why they haven't been reprimanded by their mother: "Why you'd think their mother would" and then she considers: "Maybe they have no mother" and are orphans.